Many trucks today allow the driver to add running lights to enhance the look and feel of their pickup. We will discuss some of the pros and cons of just a few of the popular brands of running lights in this article. The KC brand has been famous for allowing the driver to easily add auxiliary lighting to just about any truck. One of the benefits of the KC SlimLites series is that it offers the user the ability fit just about any mounting position, giving the impression they came factory installed. 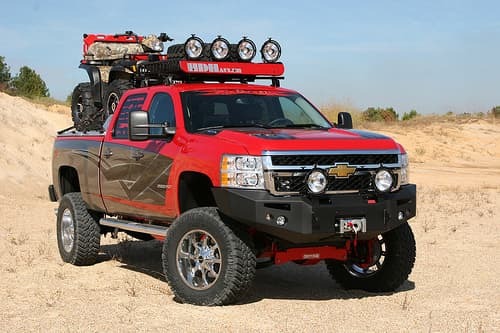 These lights are very small and very powerful, a great combination for truck enthusiasts. This series usually receives rave reviews, with the only exception being the installation directions are sometimes hard to understand. Hella is known as the premier lighting company. They are renowned worldwide for their durability and the light power. Many of the Hella lights, like the 500 series, offer the driver twin lamps that are packed into a rugged black housing that can take a tremendous beating. One added benefit to Hella is they include the stone guards to protect the lamps in just about any driving condition. The only downside to Hella brand is users complain some of the series are not as durable as the 500 series, but overall this is a top notch company that continues to lead the way in the lighting industry. Pro Comp driving lights offer the driver the ability to put a very powerful light in a very small area. The 5″ lights are slender and durable, allowing you the ability to place the lights in just about any area of your vehicle. The H3 quartx halogen bulbs are perfect for lighting in the most extreme conditions and with Pro Camp you are allowed to choose both finish and lens style. In addition you can also choose whether you like steel, chrome or black steel. A huge benefit and why many continue to use this particular brand is that Pro Comp offers a lifetime warranty on the lights. One of the only drawbacks with this brand is users say the light power could be a little stronger, but for the price the value far outweighs any lighting issues. When looking for a set of auxiliary lights for your pickup, be sure to research each particular series before you make that purchase. KC brand makes numerous series and many are rated 5 stars. Occasionally a series may have a defect or flaw that users have identified, and that could save you some aggravation down the road if you do a little homework before the purchase.